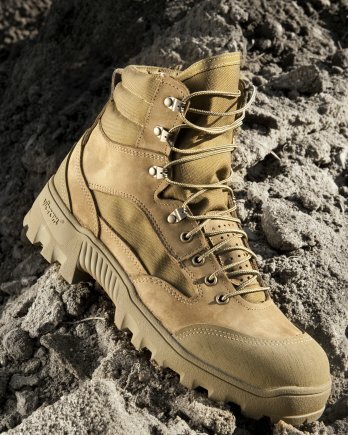 The new hot weather Mountain Combat Boot for the U.S. Army will forgo water proofing for maximum breathability. Early in the Summer we covered that Natick had put out an RFI on water proof mountain combat boots that would breathe well. As it turns out they didn't find any that met their full wish list at least for the time being. However, it is noted in the release on the latest soldier footwear, that it will have drainage at the instep of the foot. 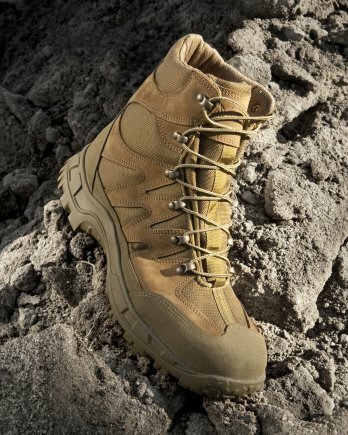 Top military boot manufacturers Belleville and Wellco developed the new Mountain Boots. These boots are the Hot Weather version that includes perforated leather to bring easy venting. Clearly this footwear has its place in Afghanistan. Soldiers will be testing out the original version to find out any faults and allow the designers to further tweak the design if needed. It is not noted if they will narrow down the selection to just one boot or end up issuing two options. As we have seen in the development of outdoor clothing and footwear, it can be tough to meet protect against all conditions that different environments can throw at you. Clearly in this case Natick along with PEO Soldier, and PM SCIE decided to focus on particular areas of operation to best combat current conditions faced by soldiers. Many outdoor apparel products can meet the needs of moisture wicking, while at the same time providing protection from wet conditions. But they also don't come in constant contact with rocks and other materials that can quickly wear out materials that are not extremely tough. The quandary of providing a water resistant boot, while at the same time not trapping moisture produced by the foot can be quite problematic. They saw what many shoe manufacturers have seen, that the technology is not quite there yet for a durable boot that can stand up against harsh mountain terrain and not compromise on waterproofing or breathability. Hot weather can leave your feet swimming if your footwear does not breathe, which defeats the purpose of protection from outside moisture. Luckily a lot of shoes and boots that are easily vented also dry very quickly. Added features like the drainage ports and easy dry socks can certainly provide soldiers with a highly functional product without the need to protect from getting wet in the focused environment. We can see from on one of the photos that they stuck with the requested Vibram sole that has become quite popular when it comes to military footwear. Belleville and Wellco also provided a very sleek designs on the sole and upper of the boot. It is not specified but we will venture to guess based on other boot designs that the top photo shoes the Belleville model, while the bottom is the Wellco selection. Natick did not touch much on other features that provide for lightweight and comfortable hot weather mountain boots, but these were all factors they keyed in on and it appears they are satisfied with the end results.